This post may contain affiliate links, which means we may receive a commission if you purchase through our link. Clicking these links won’t cost you any extra money and they help keep this site up and running! The food: My boyfriend’s birthday was last week (I won’t say how old he is, but he does have more white hair than I), so I surprised him with a homemade cake. Cake is often much too dry for my taste, so I set out to make the moistest chocolate cake possible. Also, I’m not a fan of typical frosting, which can be gritty or flavorless, so went with a rich and creamy chocolate cream cheese frosting. As I type this, I’m starting to realize this cake was a lot more about me than him. Oops! The music: When I’m making something sweet and rich, Ella Fitzgerald is my go-to gal (my Classic Cheesecake is another example). 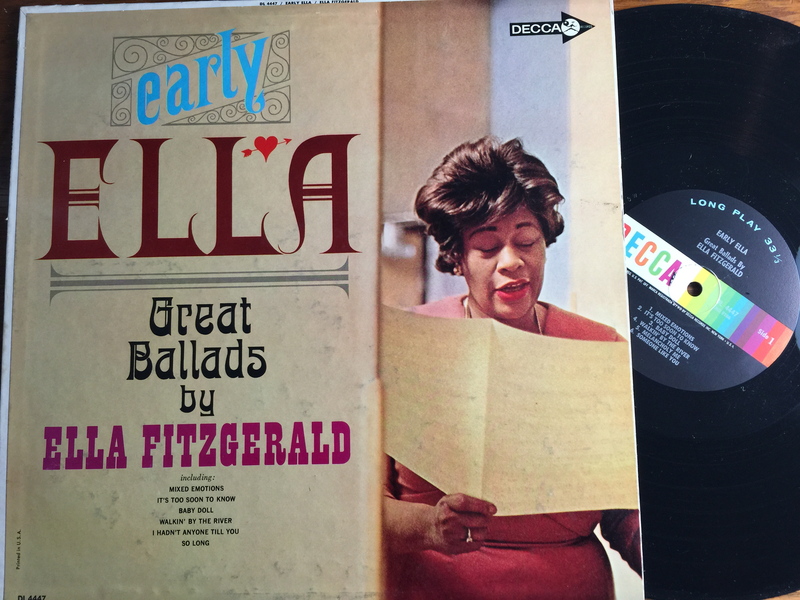 This time, I chose “Early Ella: Great Ballads by Ella Fitzgerald” because we had found it uncovered a few days earlier at an estate sale—for $1! This 1963 Decca LP includes 12 smooth and soulful that truly showcase the beauty of Ella’s voice. It’s one of the best albums for those who prefer slow, sweet Ella to peppy, sassy Ella. It’s the kind of album that will make you fall a little more in love, and it pairs perfectly with decadent desserts and white wine. 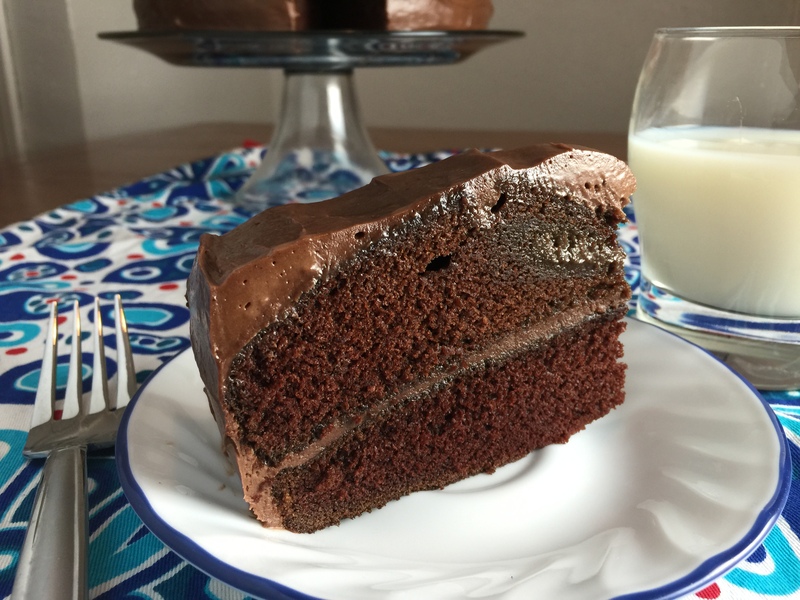 Although I much prefer pie to cake, this dense and super-moist chocolate cake recipe is something I’ll actually eat—and enjoy. It’s made all the better, of course, with a generous layer of the cream cheese frosting. In the past, I’ve been guilty of ruining cakes by being impatient and trying to ice them too quickly. For a photo-worthy cake, let the cake cool completely before adding this nicely spreadable frosting one section at a time. Prefer bars to cake? Try my recipe for Chocolate Chip Brownies, too. In a large bowl, combine all ingredients with an electric mixer. Batter will be thin. Pour batter evenly into prepared pans. Bake 30 minutes, until toothpick inserted into center of the cake comes out clean. Let the cakes cool for about 10 minutes before removing from pans. 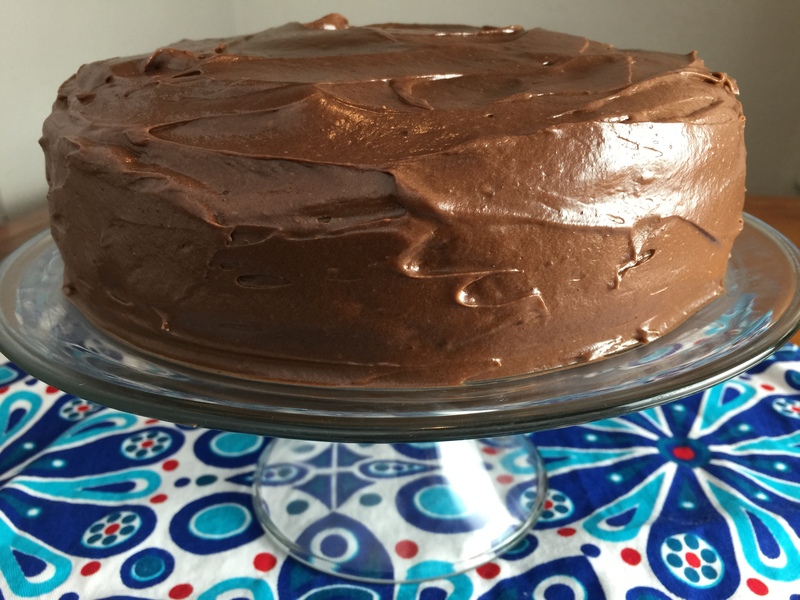 While cakes cool completely, make Chocolate Cream Cheese Frosting. Beat cream cheese, 3 tbsp. milk, powdered sugar, butter, vanilla, cocoa, and cinnamon until smooth and spreadable. Add milk if needed to make thinner. Spread evenly between and over cakes. Cream cheese…yum! 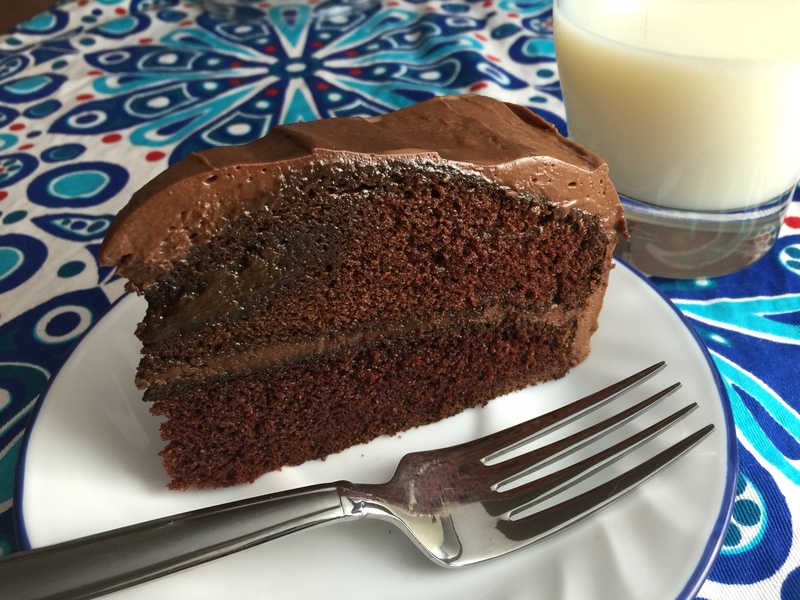 Thanks for sharing with the Thursday Blog Hop…can’t get enough chocolate cake! Thanks for reading and commenting, Pam. I hope you enjoy! Oh my heavens! This cake looks beyond dreamy! That looks soooo delicious! It’s making my mouth water. Thank you so much for stopping by to read and comment. Have a great week and come back soon! Hi! Stopping by from Nifty Thrifty Sunday link up. Your cake looks so yummy! I’ve pinned it to save for later! Thanks for sharing! Thanks for reading and commenting, Ash! Hey Becky! Chocolate is ma thing! This looks sinfully delicious, I really wanna come through the screen and eat some of that! 🙂 Stopping by from ‘What’d You Do This Weekend Party’. Pinning! This cake looks DIVINE! Thanks so much for sharing your yummy recipe on the Monday Funday Party! Thanks, Pauline, for reading and commenting! Yumm! Thanks for linking up with Best of the Blogosphere. Thanks for reading and commenting, Kendra! Looks delicious and moist, pinned. Thanks, Diane! So glad you came by today. I love your site, too!